The Agulhas Biodiversity Initiative (ABI) is a landscape initiative working throughout the Overberg region of the Western Cape, South Africa, with emphasis on the Agulhas Plain. ABI’s first phase ran from 2003 up to 2010. 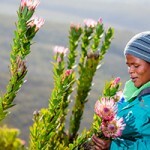 It was set up as part of the overarching fynbos conservation programme, the Cape Action for People and the Environment (C.A.P.E.). During the first phase, ABI became a successful multi-stakeholder partnership between 25 organisational representatives from different spheres involved in the management of our area’s natural assets: government, land users and conservation organisations. The ABI partners implemented a number of projects and programmes aimed at conserving biodiversity and promoting economic development on the Agulhas Plain. The first phase was highly rated during the final evaluation by the United Nations Development Programme. 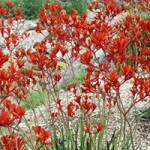 During ABI’s second phase, which launched in 2010, Flower Valley Conservation Trust was appointed as the interim coordinator. Our first port of call was to strengthen and broaden the partnership to consolidate the gains made in Phase 1. Partners also grouped their priorities into four themes. The ABI partnership today operates as a voluntary association – with members representing the private sector (businesses and landowners), government (departments, municipalities and conservation authorities) and the non-profit sector. ABI’s role is to identify players and resources and to find ways to improve connections between them. The overarching focus in all activities is to enhance sustainability, institutionalisation and long-term viability. The ABI partnership will also continue to play a leading role in co-ordinating public-private sector engagement as well as encouraging inter- and intra-government debate and co-operation around agriculture, conservation and local economic development. To convene interested and affected parties to develop a strategy for cooperation to influence land-use and development planning, as well as to develop an integrated development plan for the ABI area. To collate good quality information and data; analyse, communicate and use this data so that it can be utilised as a basis for planning and monitoring of initiatives. To facilitate communications between all parties with a particular focus on engaging local municipalities in the delivery of services that mainstream biodiversity and natural resource conservation. To conceptualise projects and initiatives by supporting partners in the identification of gaps and opportunities, including research, which guide and prioritise conservation action and projects. To raise the cash for and secure investment in priority activities and projects, including sourcing sustainable finance through innovative mechanisms and projects.